The current National Debt is about 73% of GDP and is expected to reach 80% in two years. However, the American Taxpayer Relief Act passed on January 1 to avoid the Fiscal Cliff is expected to reduce the National Debt to about 77% of GDP in 2018. 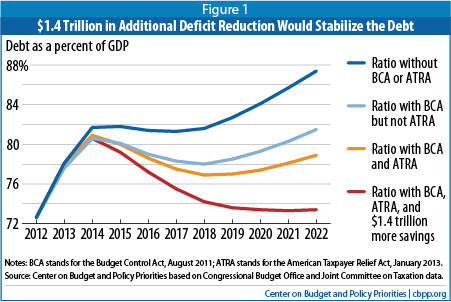 The Center on Budget and Policy Priorities has generated the following graph. The orange line shows the expected debt with currently implemented spending cuts and tax increases. Considering the National Debt reached 120% of GDP after WWII, these levels are manageable, and the short-term problem of rapidly increasing debt has largely been solved. However, without further action, the debt will begin increasing again after 2018. This is mostly due to rising health care costs and an aging population. At some point in the not too distant future, entitlement spending will need to be addressed. Demographics and health care costs make this unavoidable.